Air accident investigators have gone to the scene of a plane crash in County Galway in which two Irish Army Air Corps pilots died. Flight instructor Captain Derek Furniss and Cadet David Jevens were killed on Monday evening when their Pilatus PC-9 aircraft crashed in Connemara. It is not yet known what caused the crash but it is understood that weather conditions were poor. The pilots were on a training exercise when the accident happened. Captain Furniss, from Ballinteer in Dublin, qualified as a flight instructor ten years ago and was a member of the Irish Air Corps Display Team. 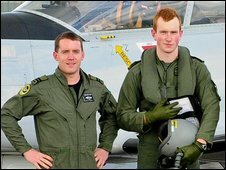 Cadet Jevens from County Wexford, joined the Irish Defence Forces in 2006 and was at the advanced stages of flight training. Rescue teams who reached the scene late on Monday said the plane had crashed in exceptionally rough and rocky terrain, 2km from the nearest road. The bodies are not expected to be removed from the crash scene until later on Tuesday. President McAleese said she had learned with "shock and sadness" of the deaths, while Taoiseach Brian Cowen extended his sympathy to the bereaved families and to the Air Corps, saying he, too, was shocked and saddened to learn of the accident.